Classes for children can be arranged at your school. Below is a description of the curriculum for different age groups. We offer many more classes for all ages, please click Here to find out more. Please contact Ikuyo Conant or Kay Miyamoto to discuss scheduling and cost. Each class is 4 weeks long. The instructor will bring all drums and materials needed. The focus of this class is body movements with rhythm using various kinds of equipment that foster children’s natural movement and balance. Equipment used for the activities are balls, hoops, jump ropes and scarves and many other things we can find around the house. Simple Taiko Rhythms are used for the accompaniment of various movements. Through play curriculum children will challenge their physical skills and development of their attention skills. This is a movement class. 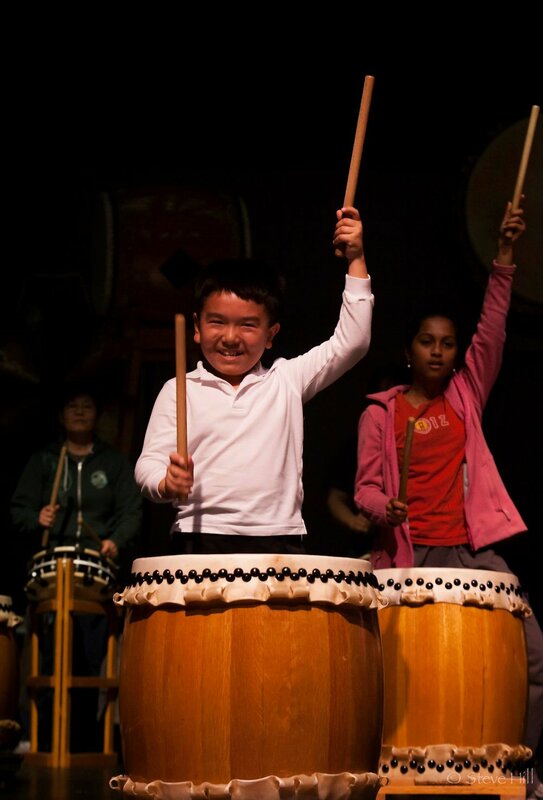 The student will learn simple drumming music with taiko as well as basic dancing movements.